The encounter begins with Cassini about 850,000 kilometers (530,000 miles) from Iapetus. Cassini approached over the moon's northern hemisphere, allowing for excellent full views of a 575-kilometer-wide (360-mile) impact basin in northeastern Cassini Regio. Astronomer Giovanni Cassini discovered the light and dark faces of Iapetus' two hemispheres (among his other Saturn discoveries), and the dark region. The spacecraft also bears his name. Also prominent in these images is a 380-kilometer-wide (235-mile) basin to the northwest of the larger basin, in the transition zone between Cassini Regio and a brighter region called Roncevaux Terra, with its 150-kilometer-wide (95-mile) crater Roland (at the top, with a prominent central peak). The movie takes Cassini to its closest approach, at about 415,000 kilometers (260,000 miles) from Iapetus, and then looks back at the moon's receding crescent. The sequence ends with Cassini at a distance of about 460,000 kilometers (285,000 miles) from the moon. Iapetus is 1,468 kilometers (912 miles) across. Images taken using ultraviolet, green and infrared spectral filters with the Cassini spacecraft narrow-angle camera were combined to create false-color frames for this movie. The color seen here is similar to that produced in (red, green and blue) natural color views. 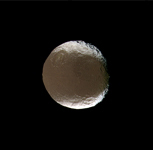 Resolution in the original images taken at closest approach to Iapetus was about 3 kilometers (2 miles) per pixel. The color frames were resized to create the movie.